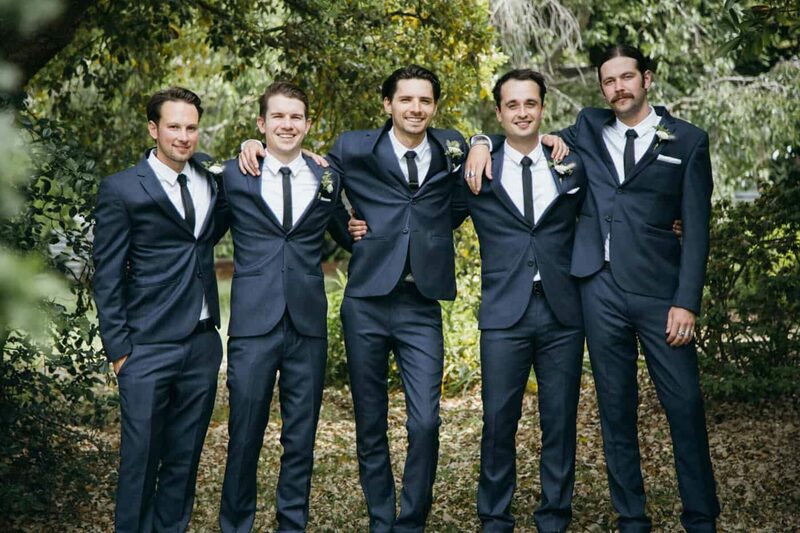 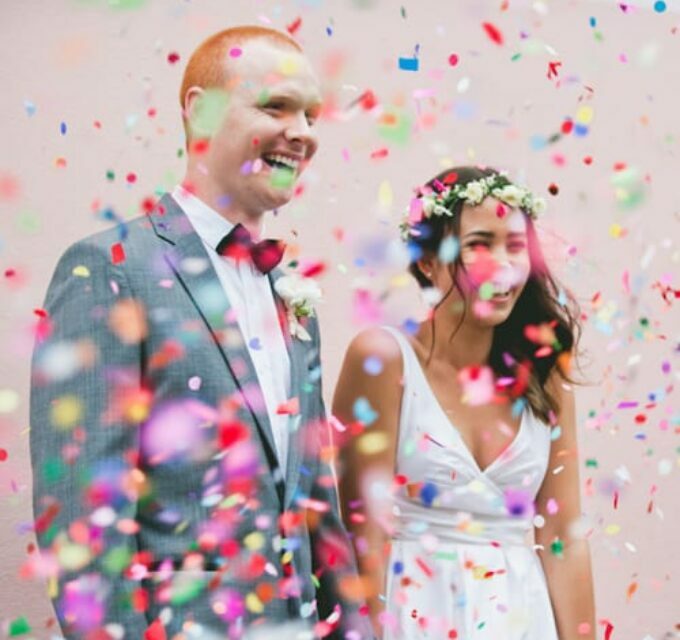 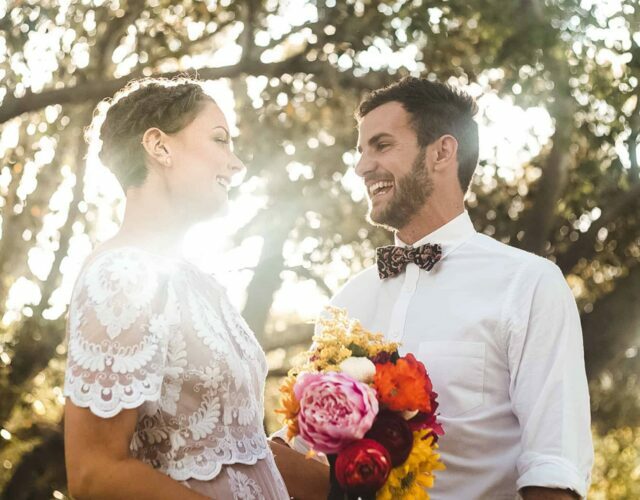 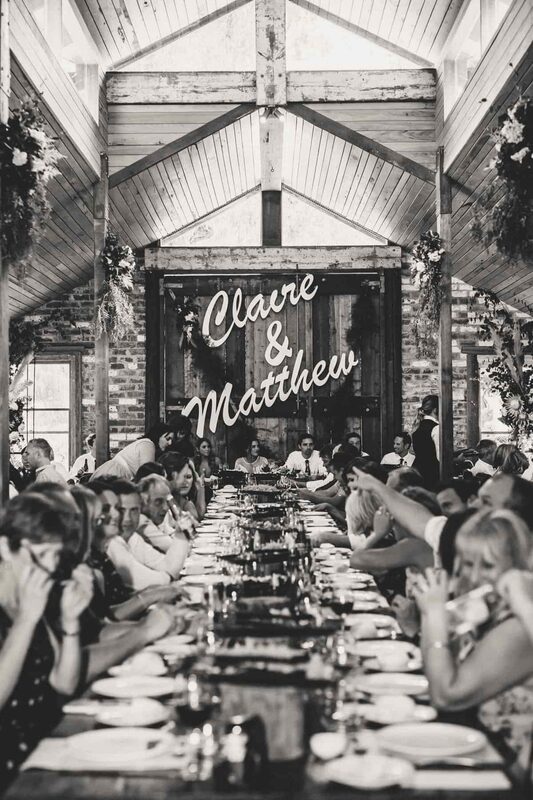 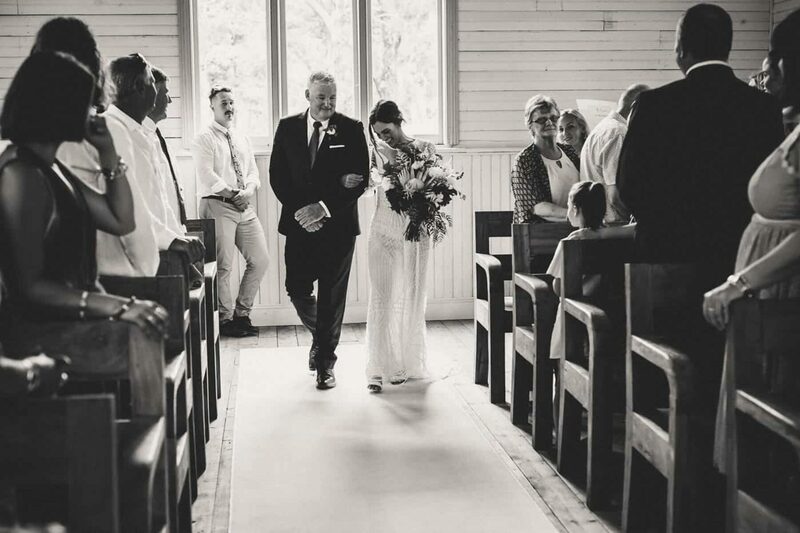 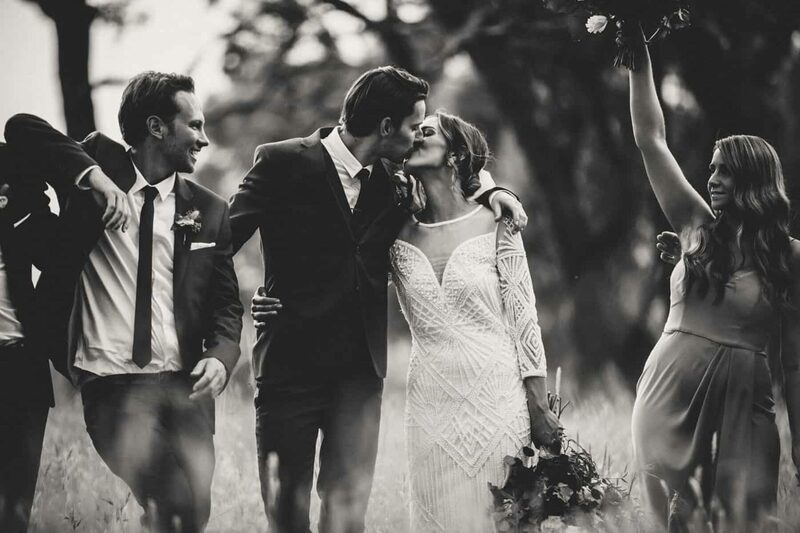 Claire and Matt wanted a wedding day that was relaxed, simple and timeless. 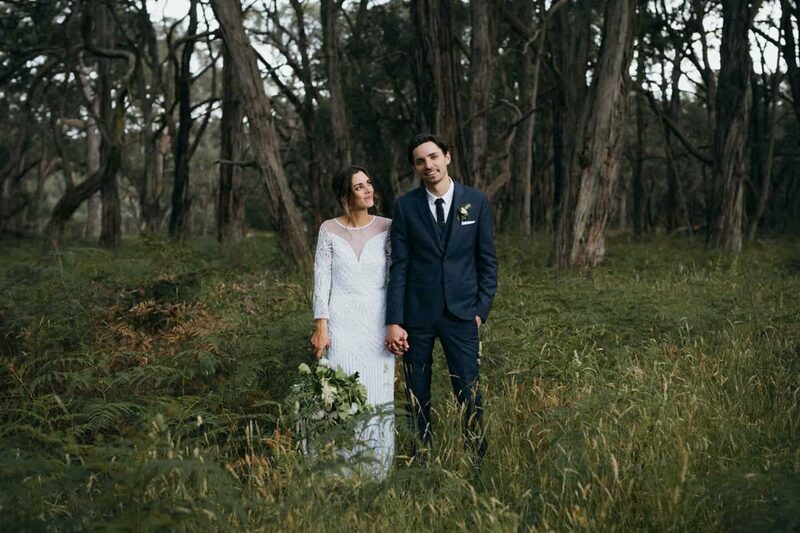 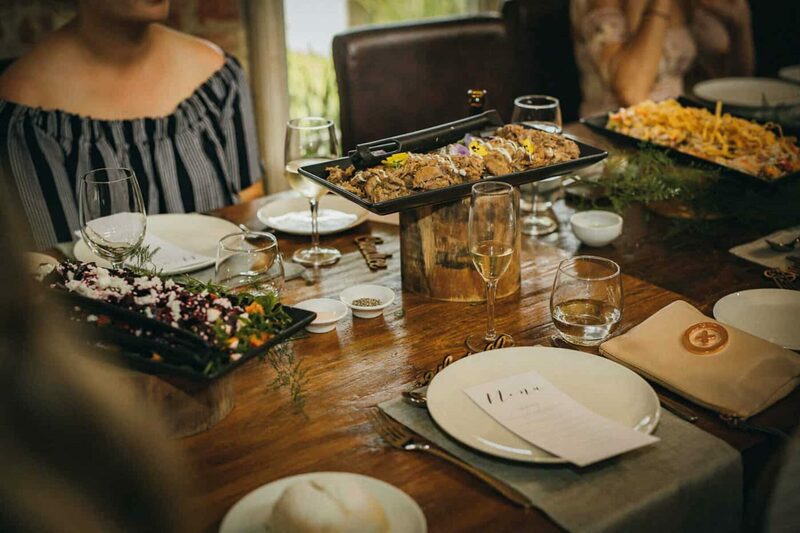 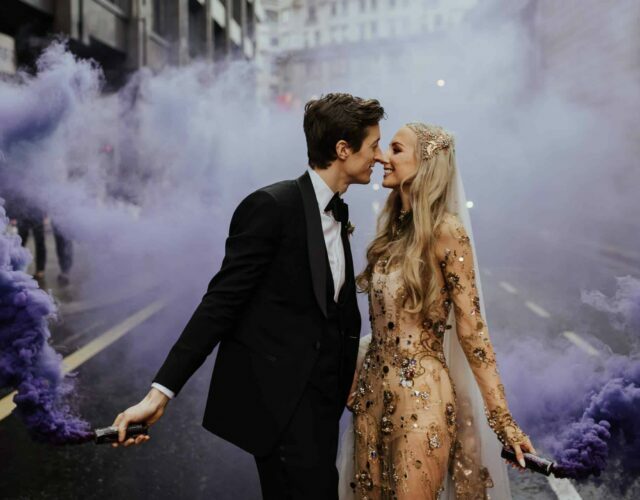 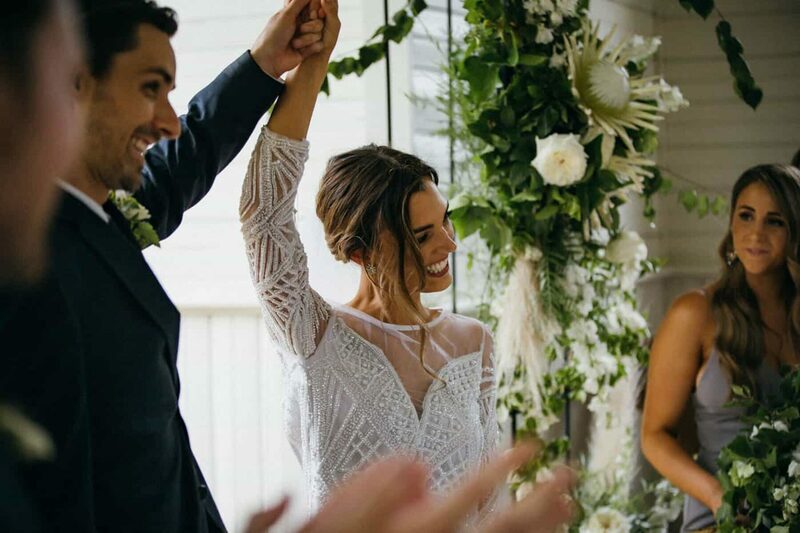 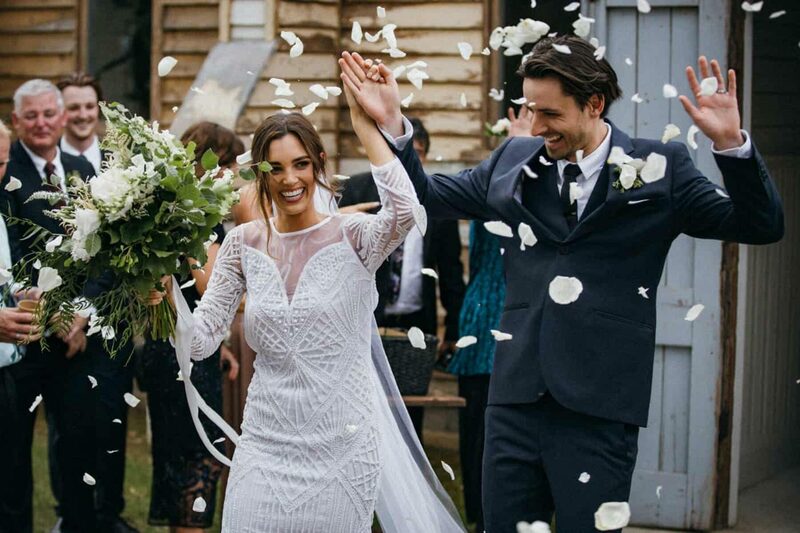 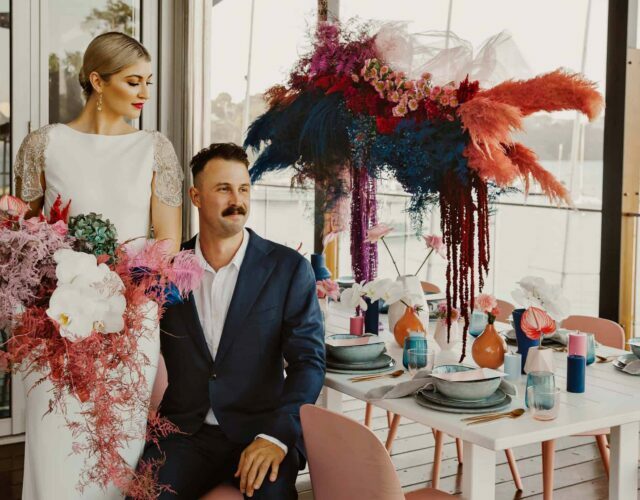 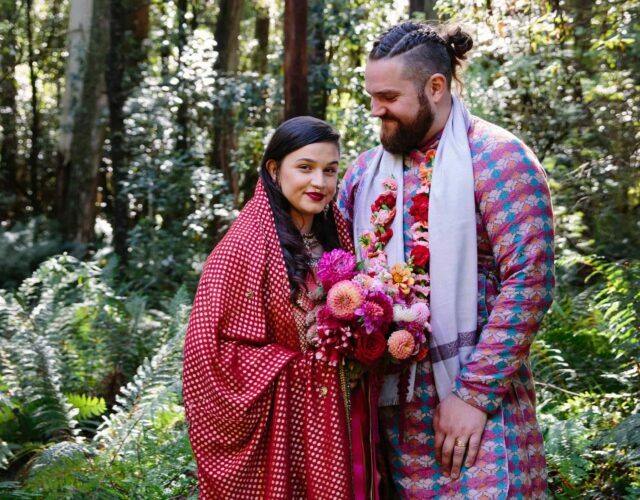 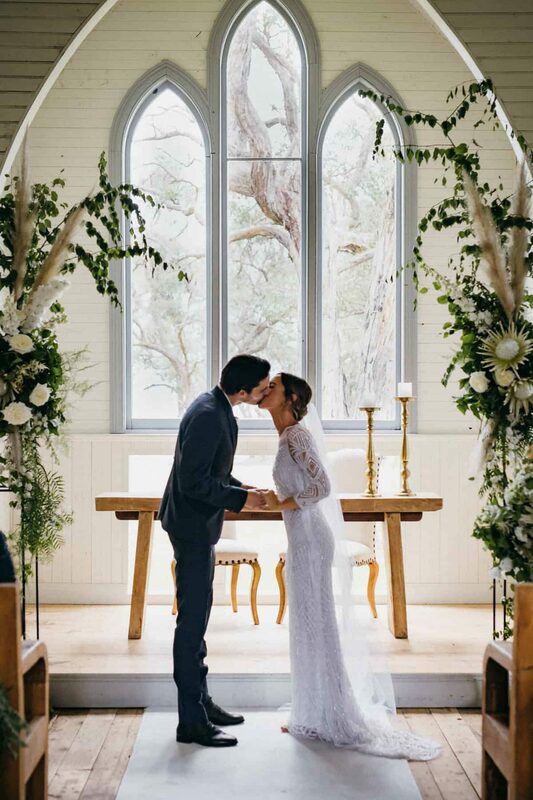 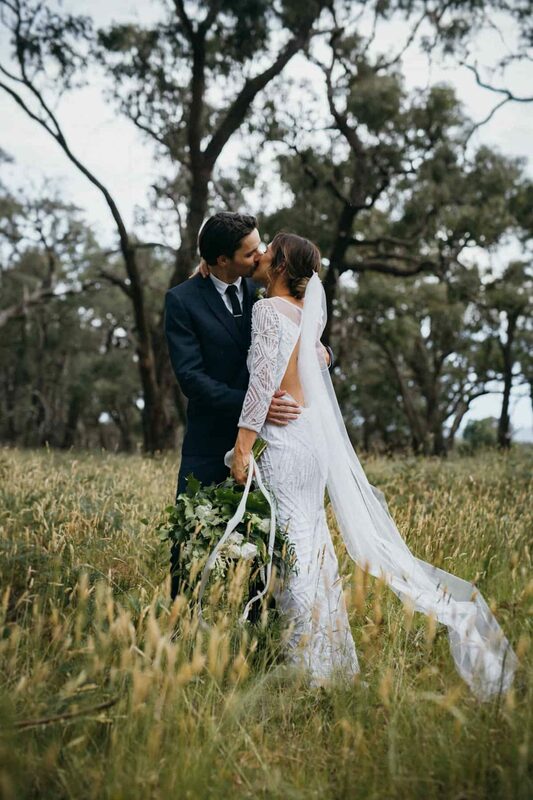 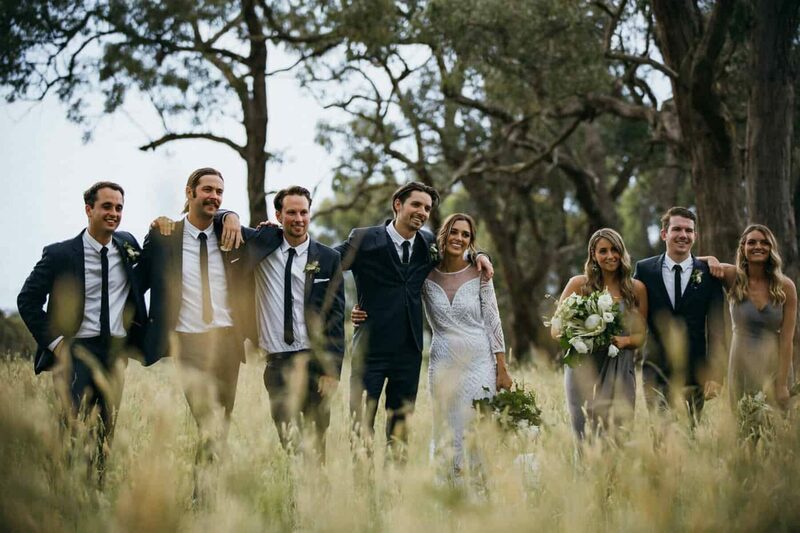 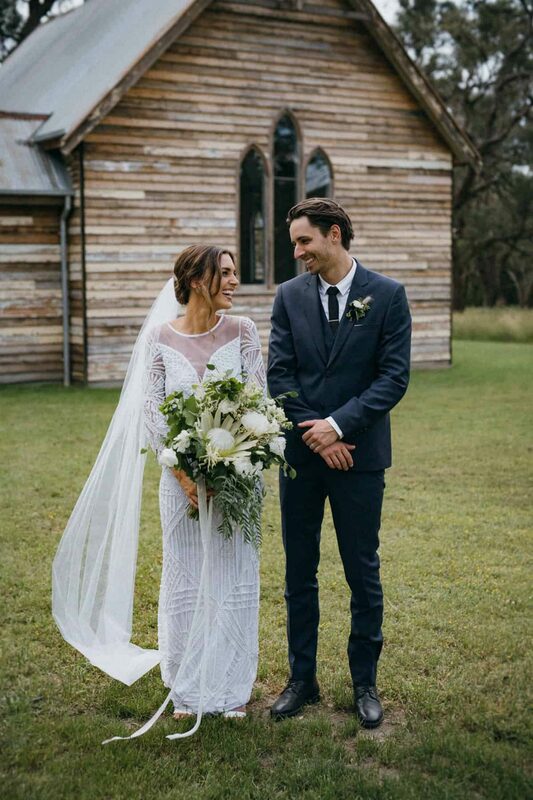 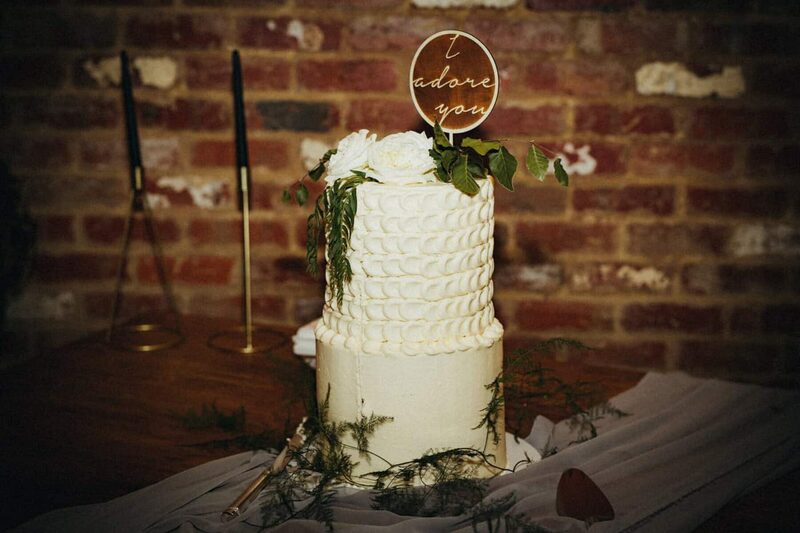 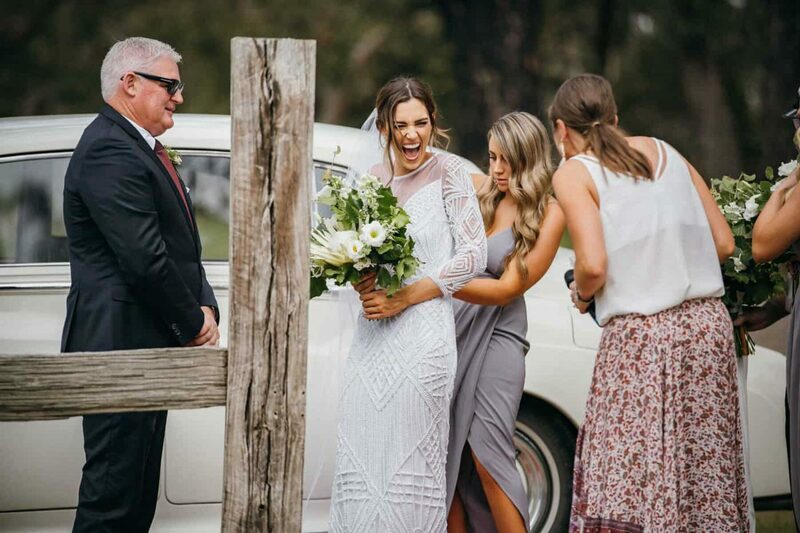 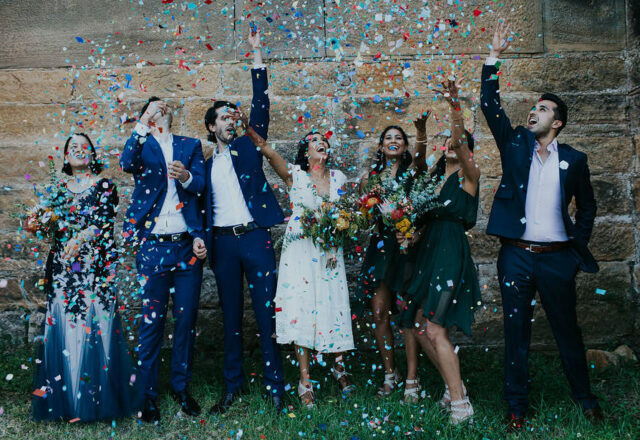 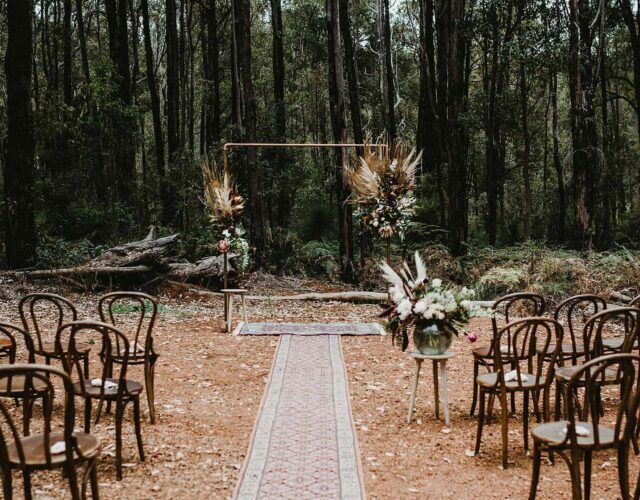 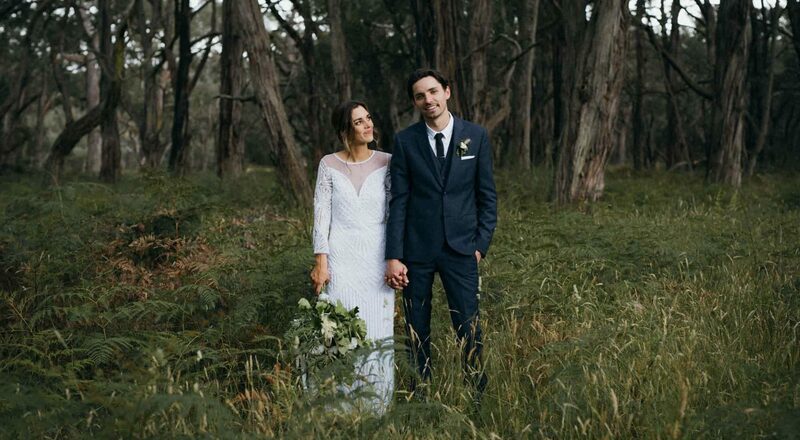 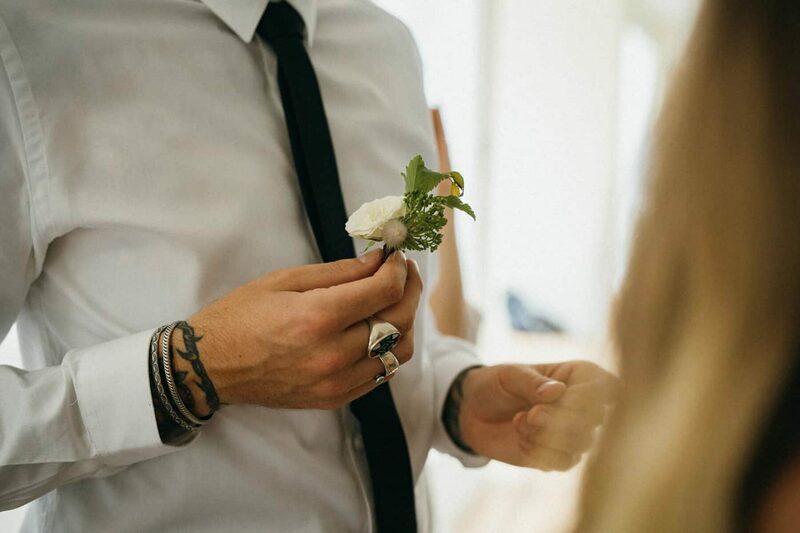 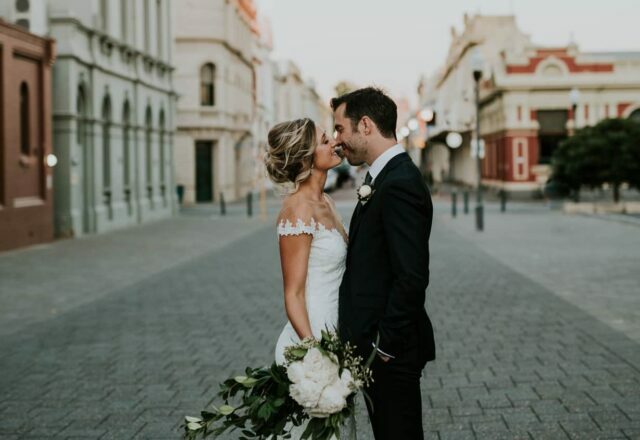 With a naturally beautiful venue and organic styling by the bride’s own floristry business, they brought their low-key vision to life with Mavis Jean along to capture the day. 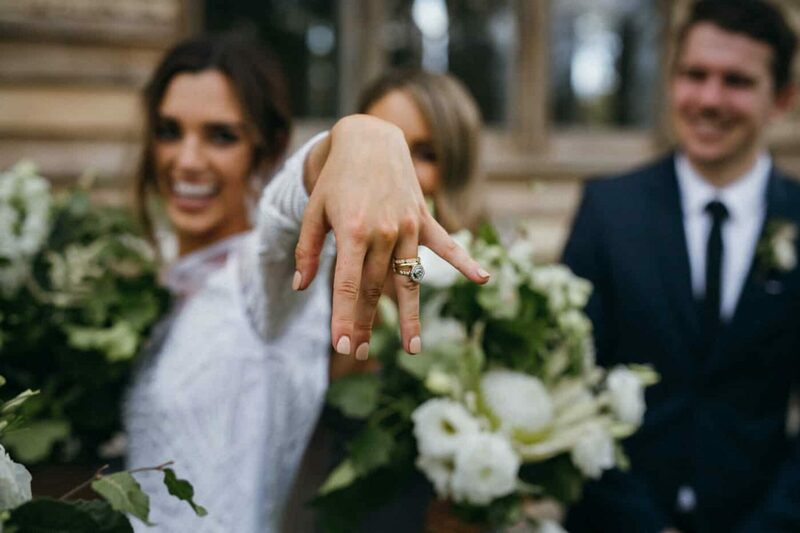 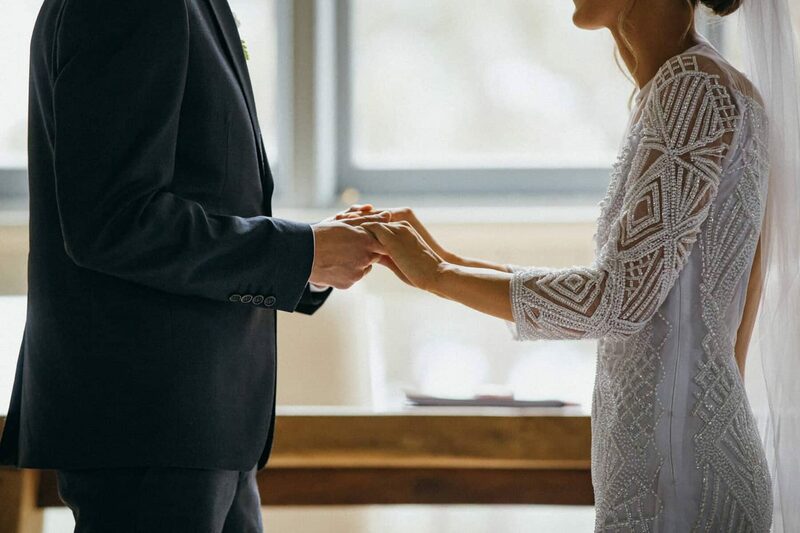 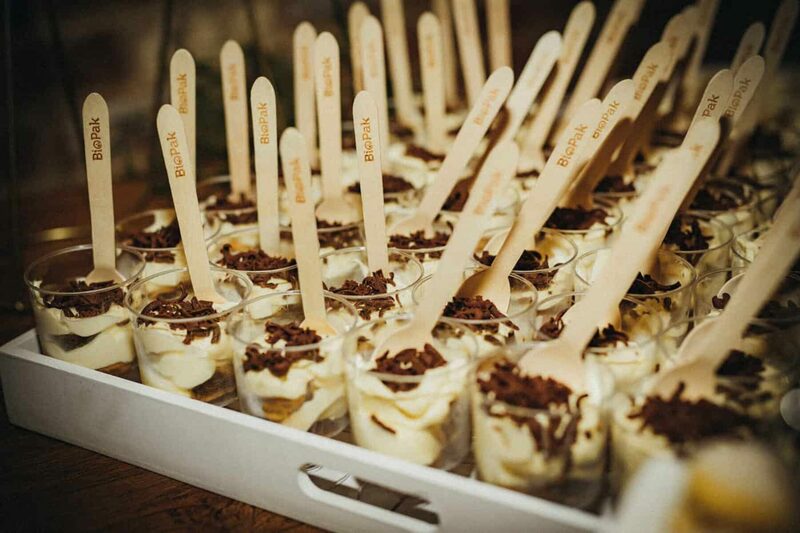 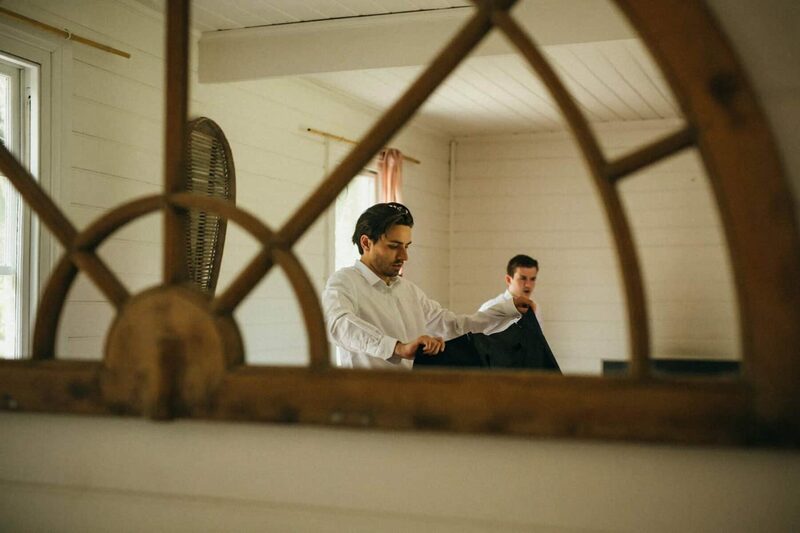 Comfort was key when it came to the venue, and having both the ceremony and reception at Tanglewood Estate allowed guests to settle in and enjoy themselves right from the get go. 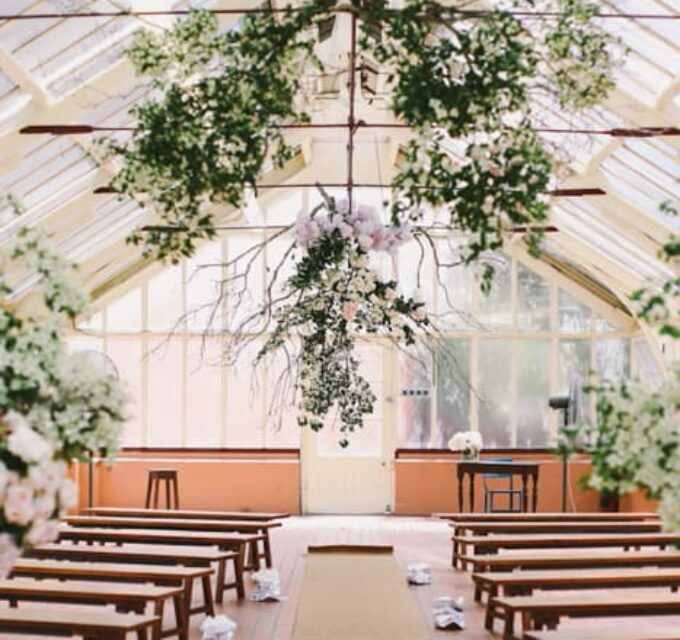 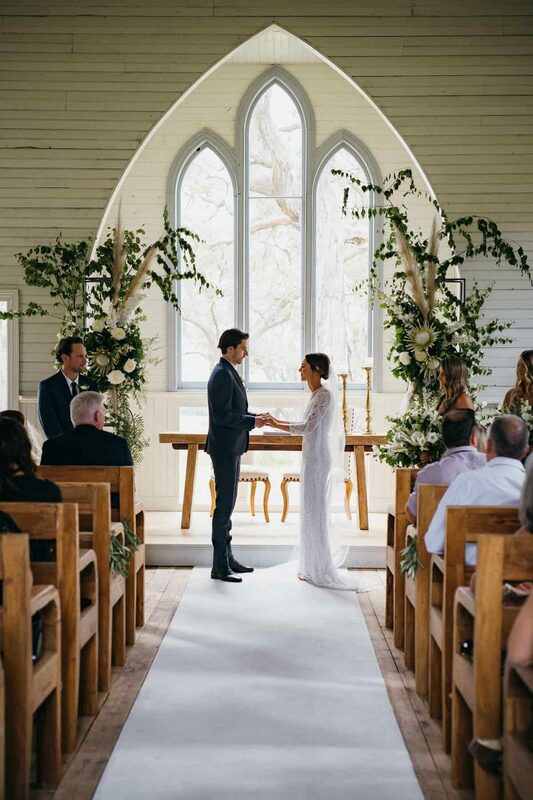 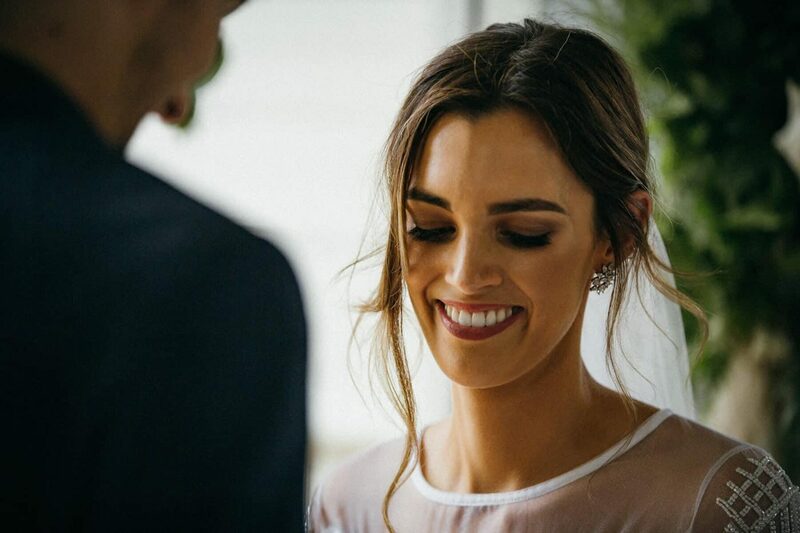 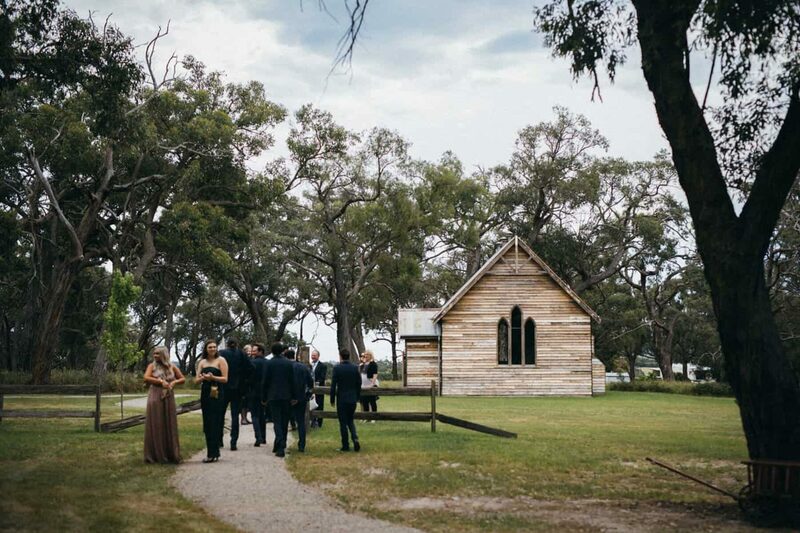 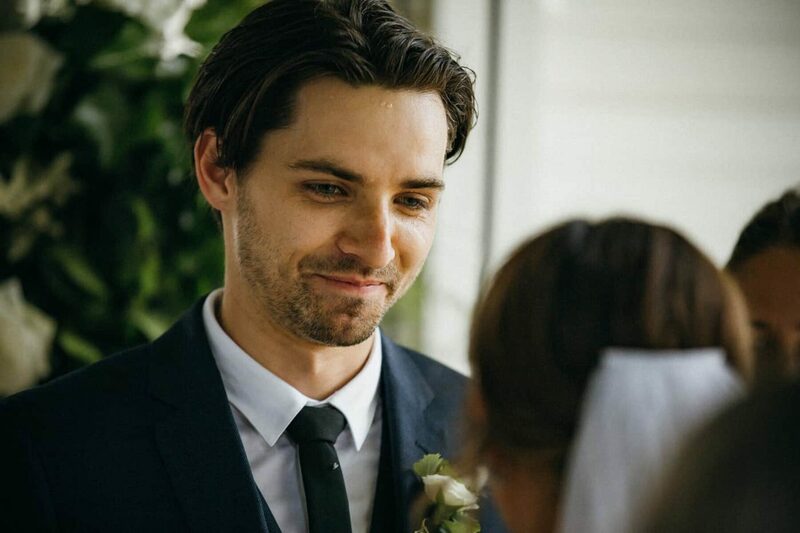 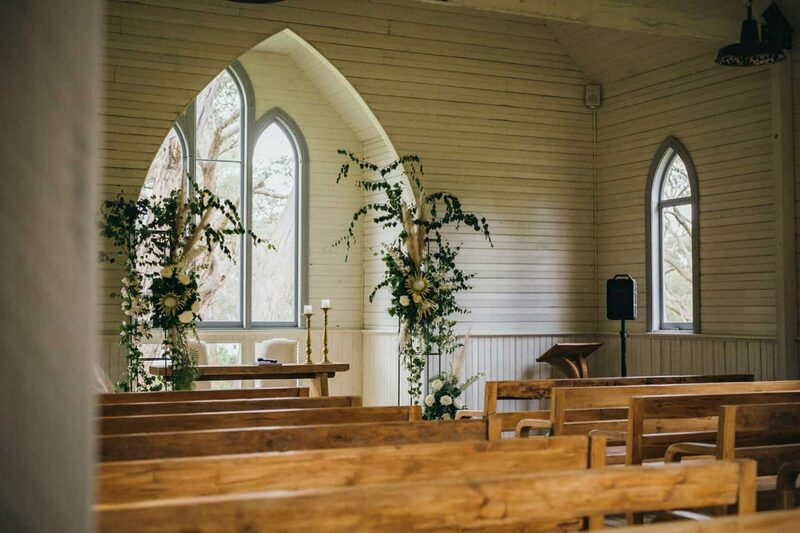 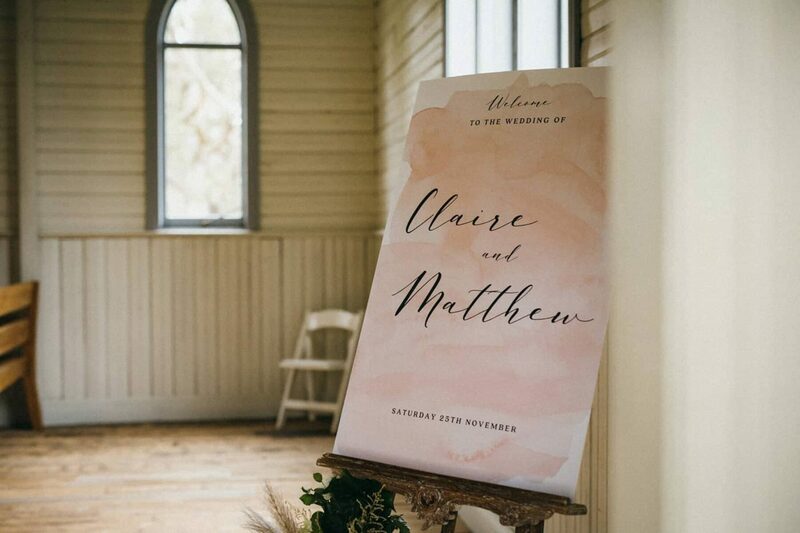 Apart from its stunning views of Port Philip Bay, this venue boasts possibly the loveliest little chapel we’ve ever laid eyes on. 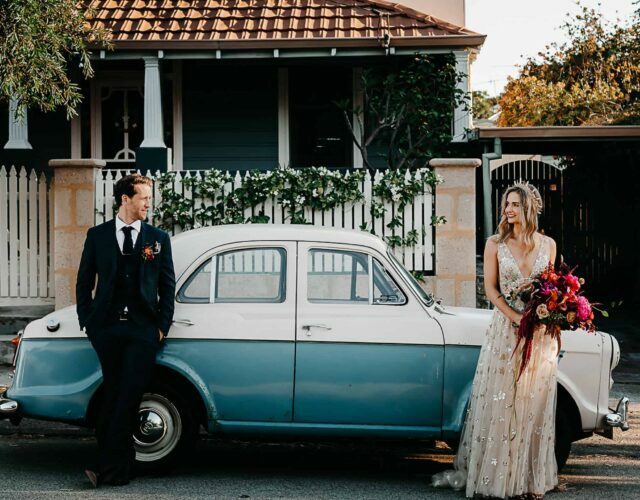 Would you believe it was actually purchased on Gumtree from a little country town and brought to its new home to be lovingly restored! 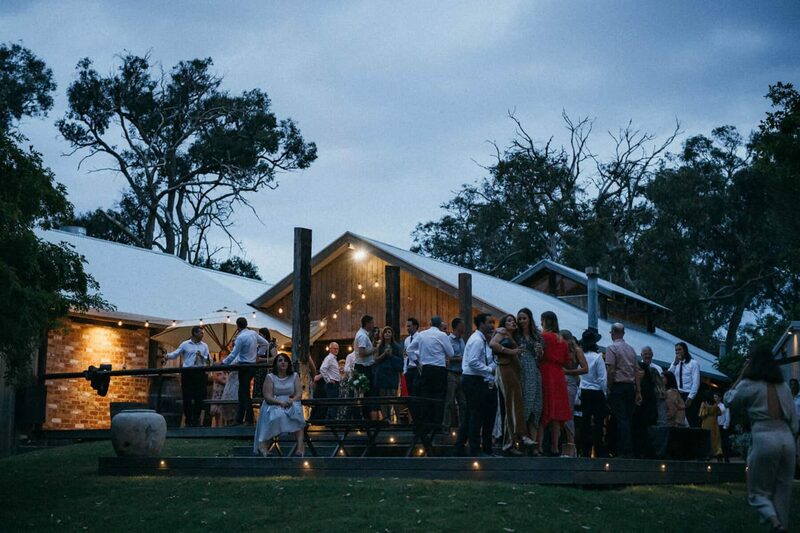 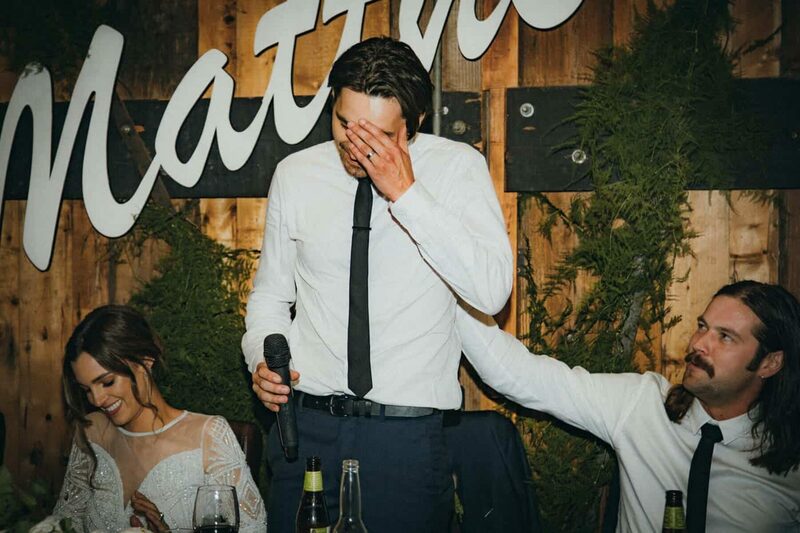 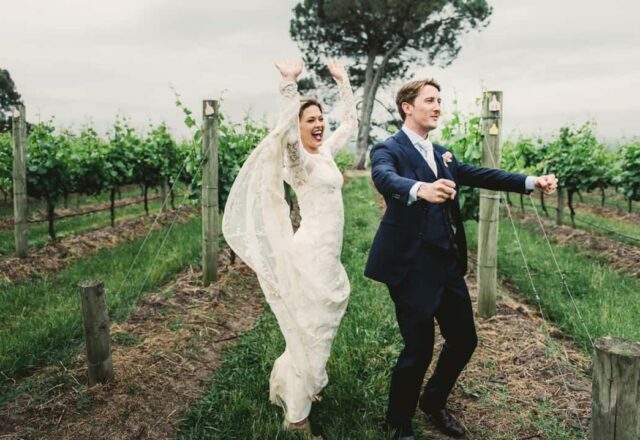 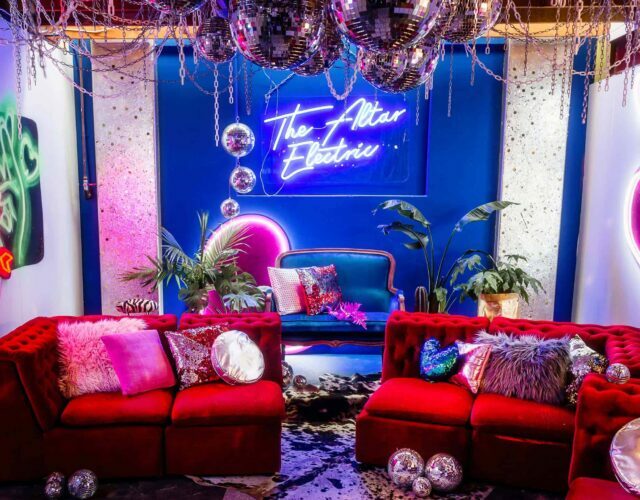 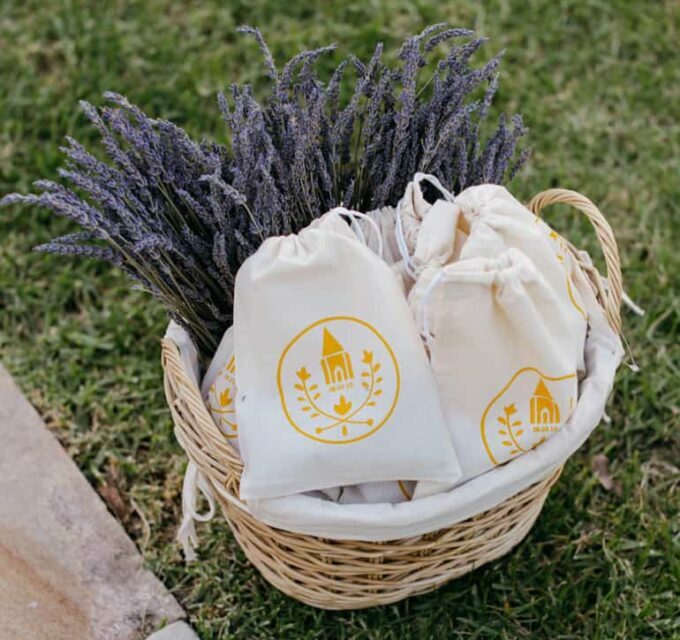 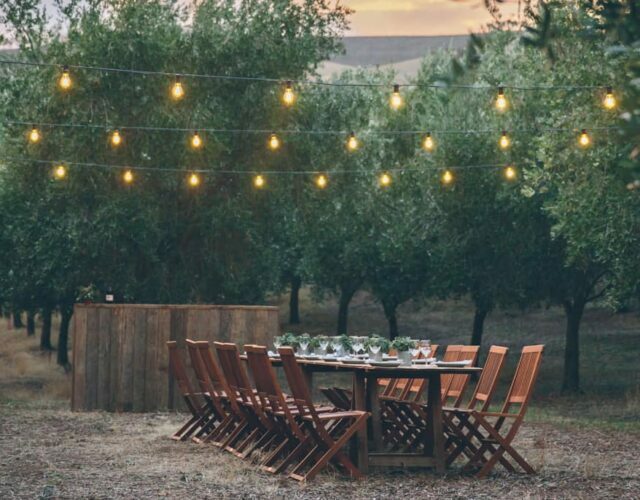 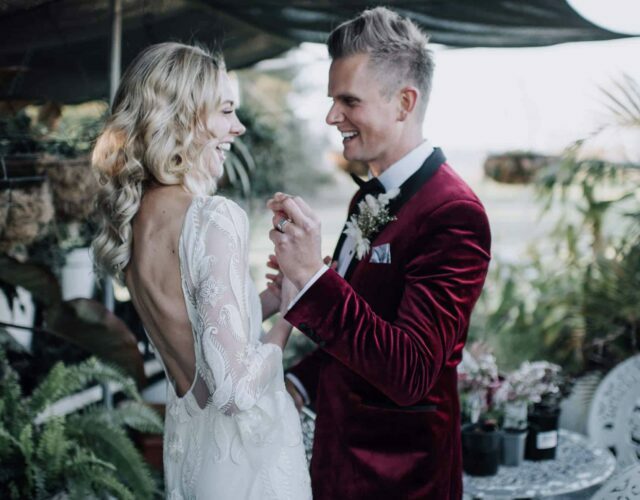 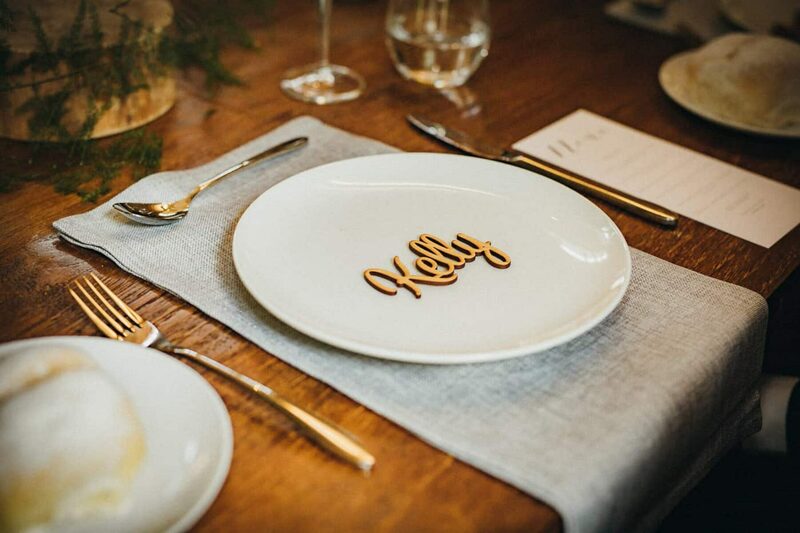 The reception was held in an old winery which is now used solely as an event space. 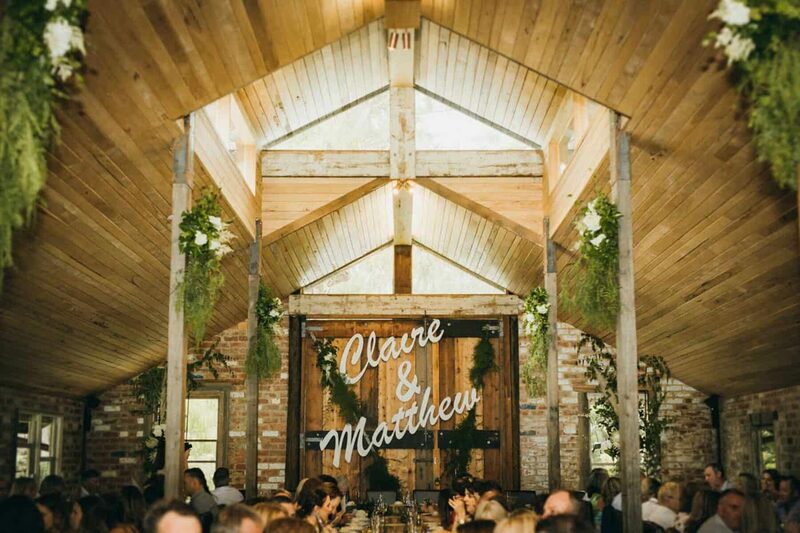 With its high ceilings, exposed beams and deck looking out to the bay over a heart-shaped dam, Claire and Matt were sold on first sight. 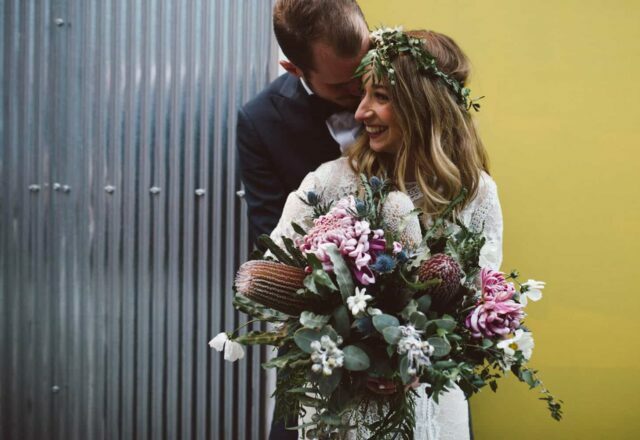 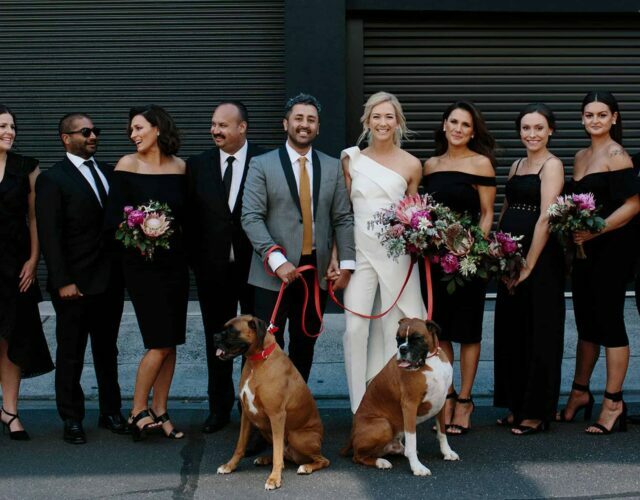 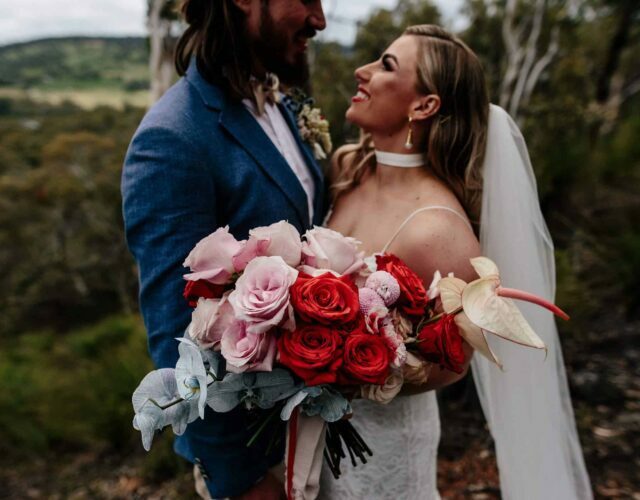 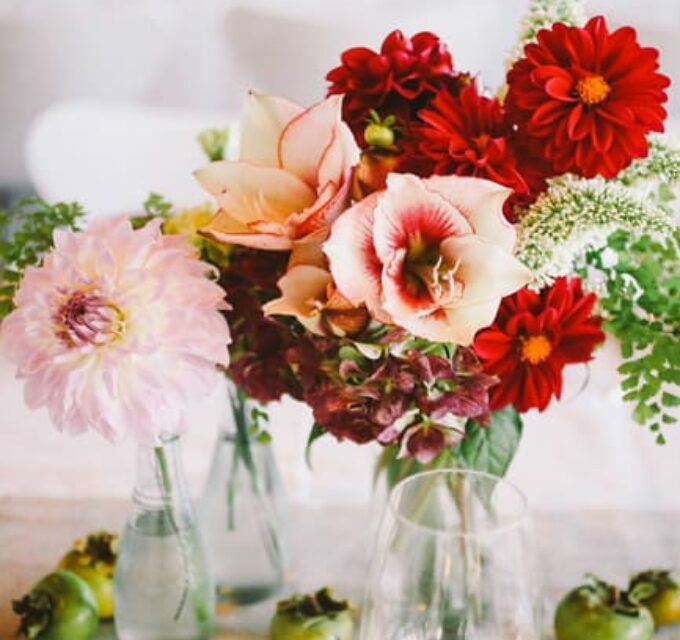 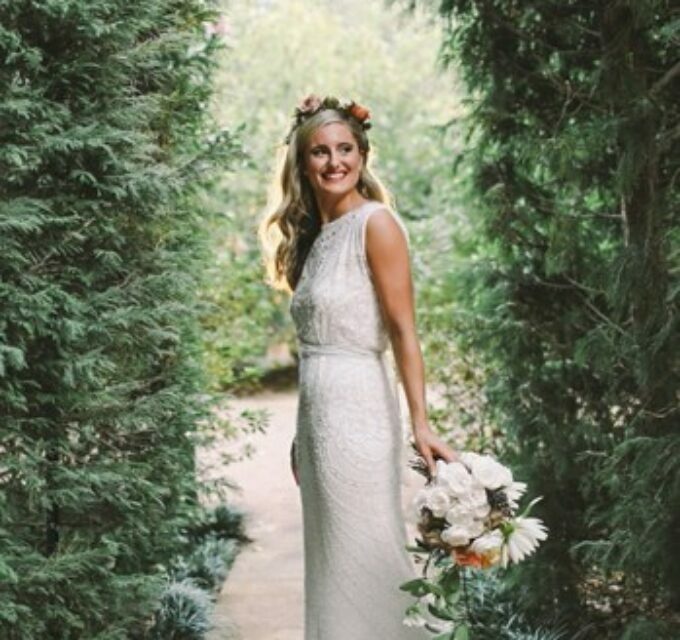 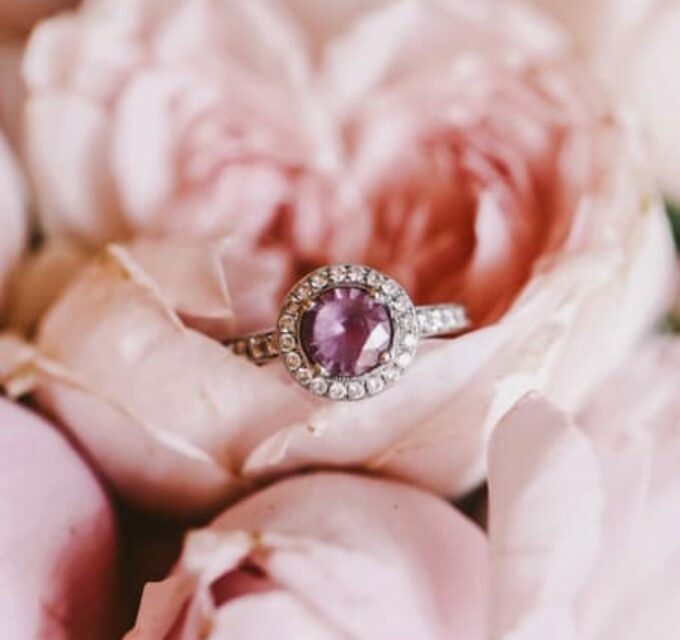 With the bride being one half of Flower Muse Styling Co, it goes without saying that the day was filled with beautiful blooms. 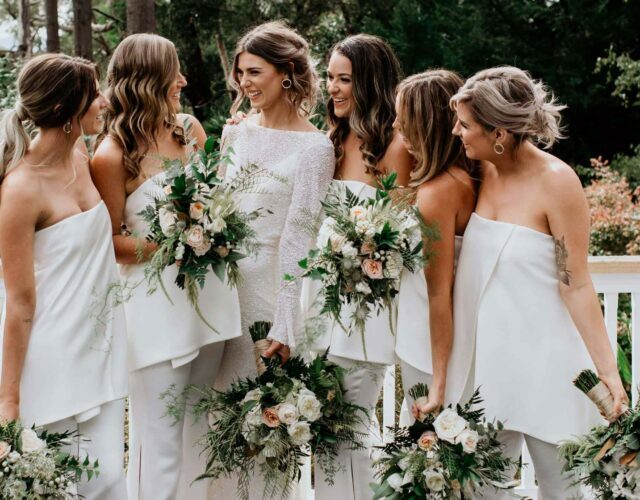 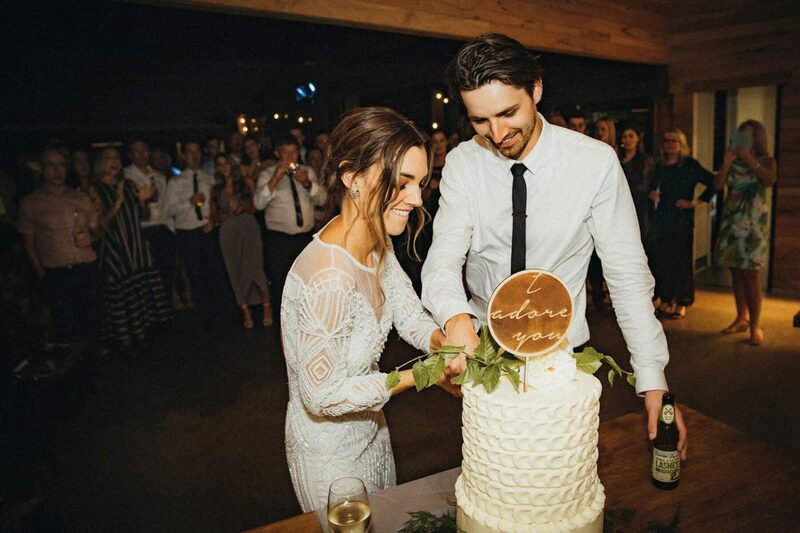 Claire kept it simple and elegant with a green and white palette, and used florals to highlight the existing beauty of both the ceremony and reception spaces, hanging organic arrangements from beams and steel pillars which were created by her brother-in-law. 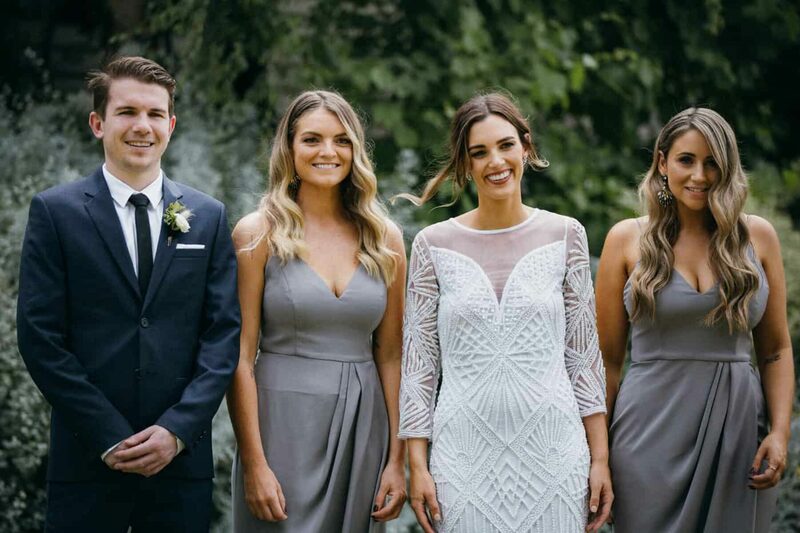 Claire's bridesmaids wore modern, flattering dresses from Shona Joy and we're loving that dove grey tone. 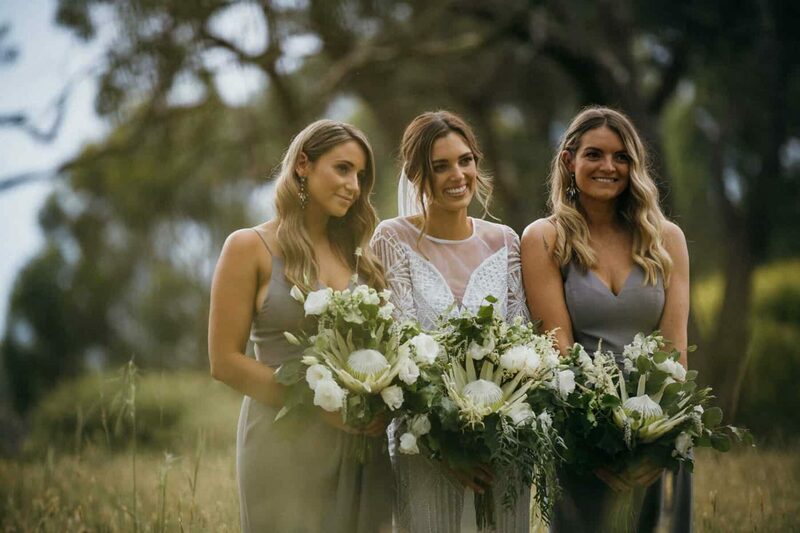 Natural makeup by Holly Harnwell and soft waves by Tori from Blisque Salon had all the girls looking radiant. 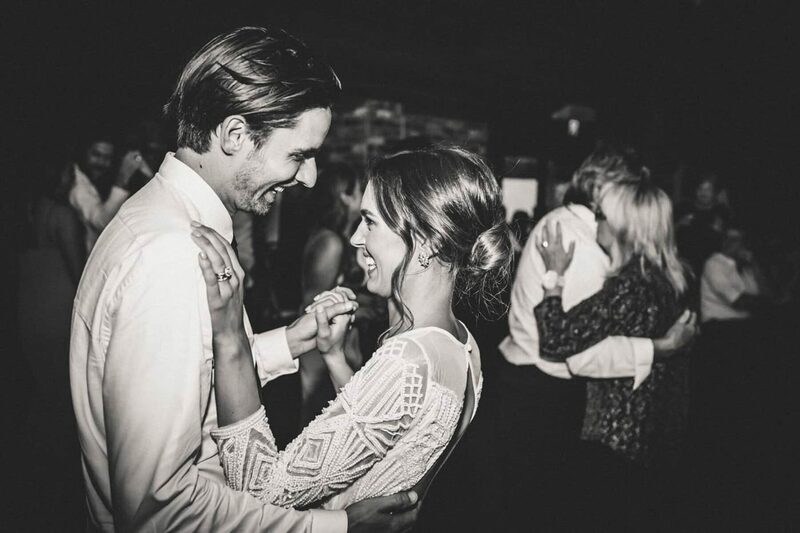 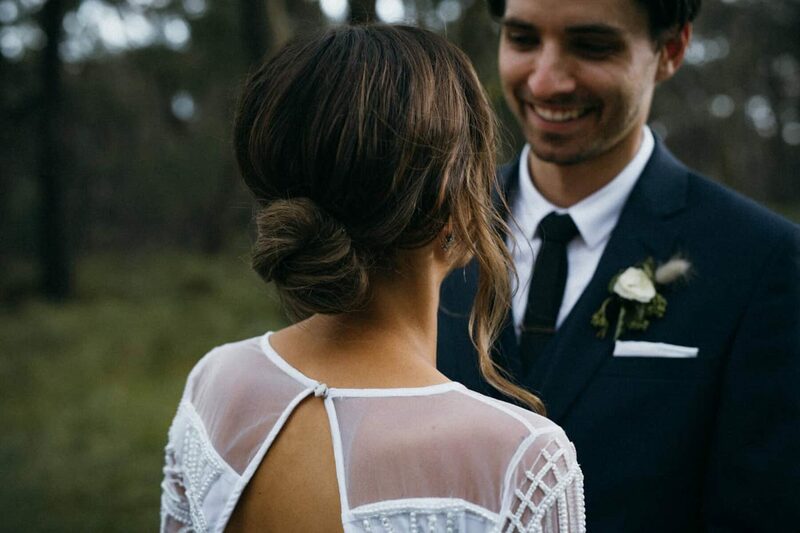 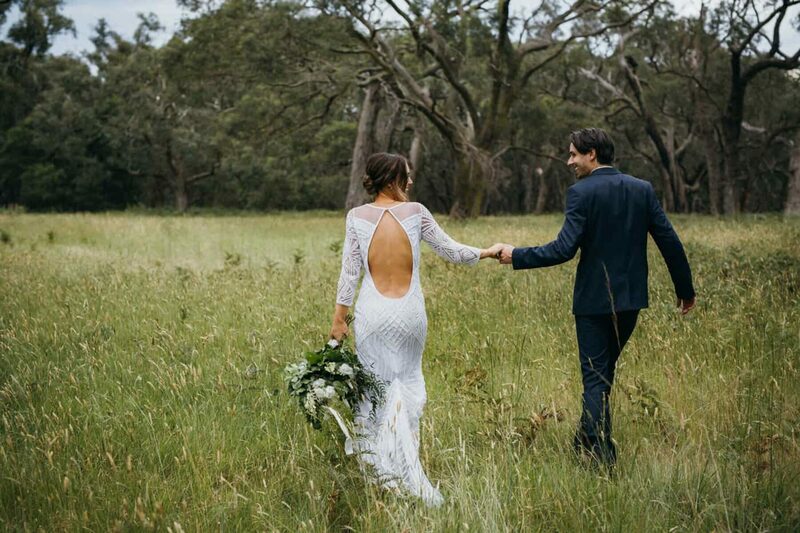 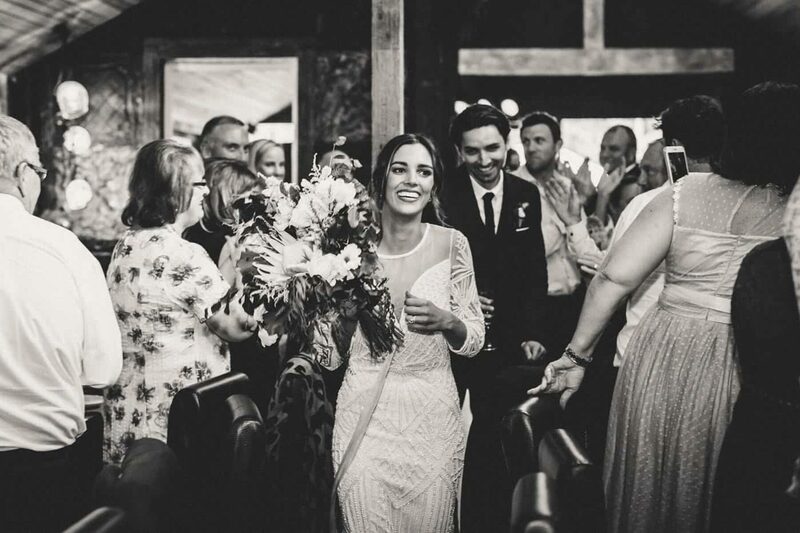 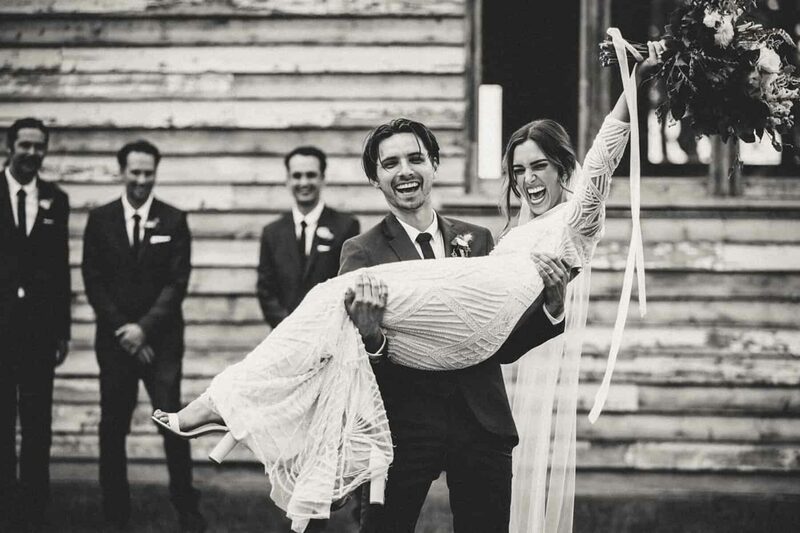 Would you believe Claire’s gorgeous backless wedding dress dress was from Asos? 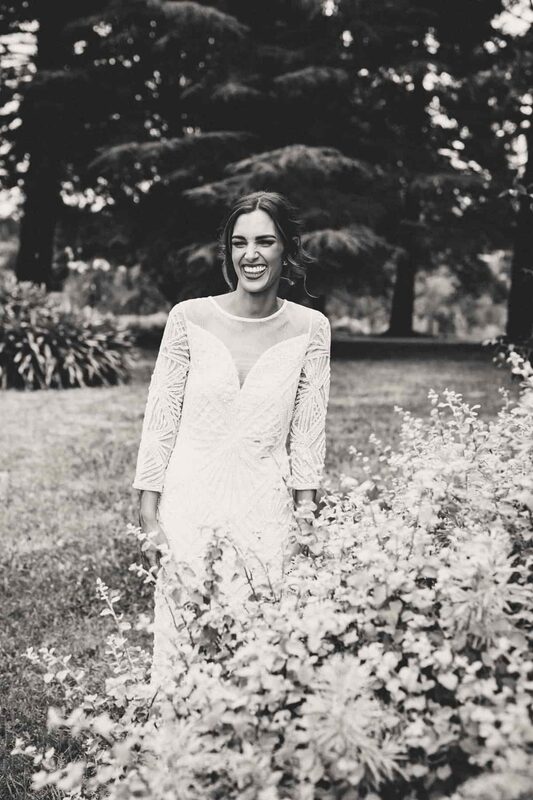 “I was so set on having a beaded dress with sleeves,” she shares. 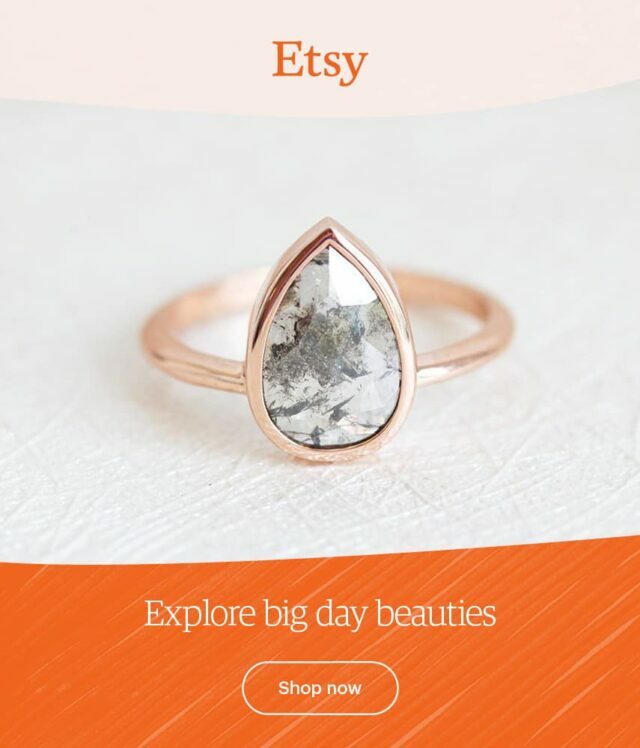 And she found just the thing on a late night scroll! 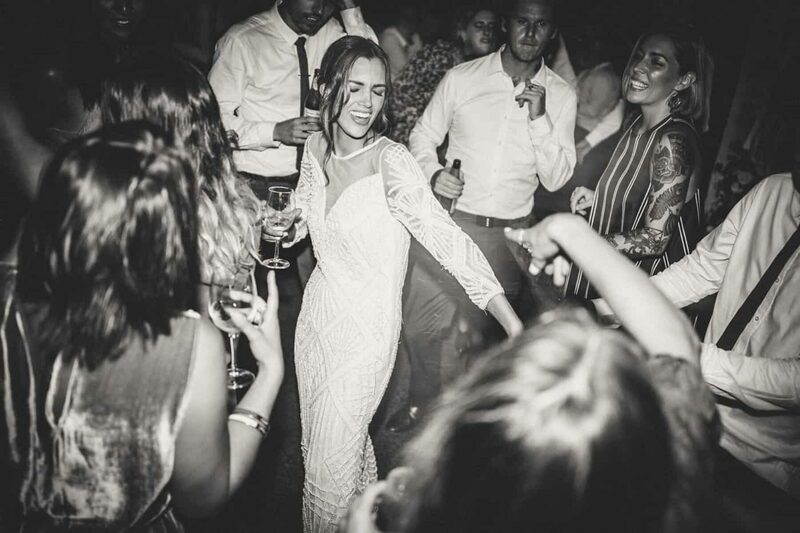 With some minor alterations it was exactly the Gatsby-inspired number she’d been searching for. 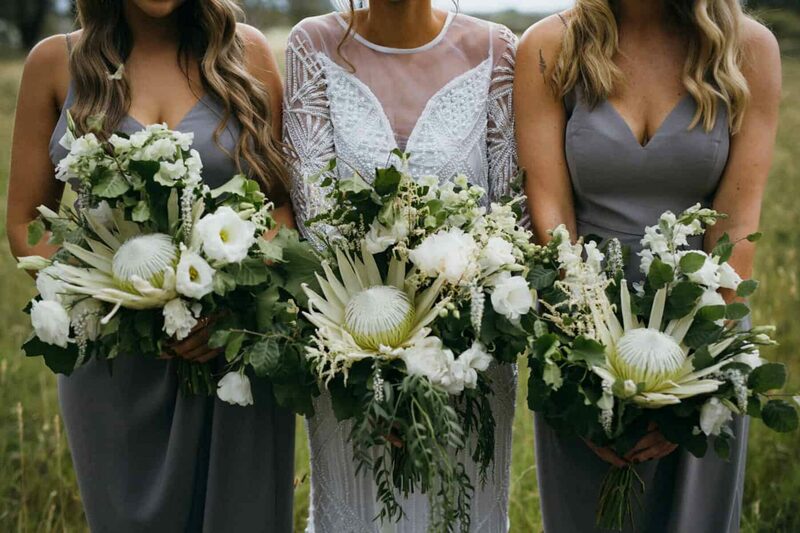 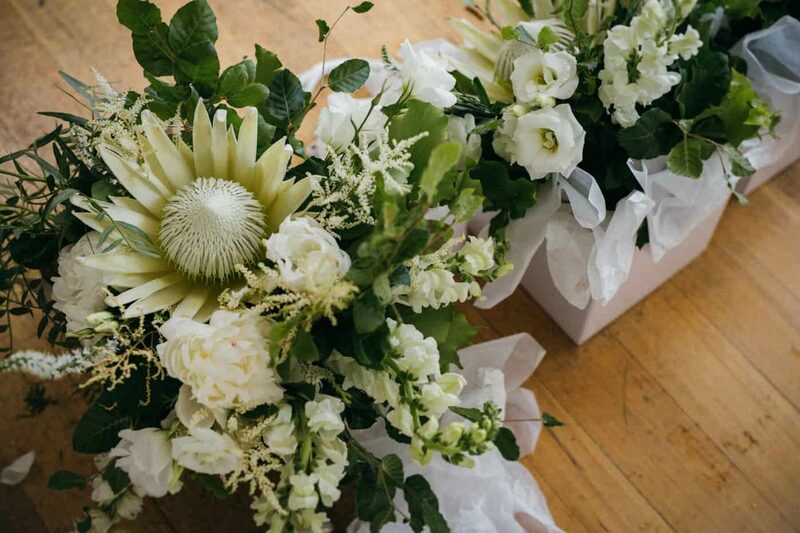 A fresh green and white palette and some giant king proteas made for some gorgeous bouquets by the bride's own florist biz, Flower Muse Styling Co.